The One Hundred Twelfth United States Congress was a meeting of the legislative branch of the United States federal government, from January 3, 2011, until January 3, 2013. It convened in Washington, D.C. on January 3, 2011, and ended on January 3, 2013, 17 days before the end of the presidential term to which Barack Obama was elected in 2008. Senators elected to regular terms in 2006 completed those terms in this Congress. This Congress included the last House of Representatives elected from congressional districts that were apportioned based on the 2000 census. In the 2010 midterm elections, the Republican Party won the majority in the House of Representatives. While the Democrats kept their Senate majority, it was reduced from the previous Congress. This was the first Congress in which the House and Senate were controlled by different parties since the 107th Congress (2001–2003), and the first Congress to begin that way since the 99th Congress (1985–1987). It was also the first Congress since the 36th Congress, over 150 years, in which the Republican Party held the House but not the Senate. In this Congress, the House of Representatives had the largest number of Republican members, 242, since the 80th Congress (1947–1949). After delivering the 2012 State of the Union Address on January 24, 2012, President Obama embraces Congresswoman Gabrielle Giffords, who had been shot the previous year. January 6, 2011: On the second day of the 112th Congress, the House of Representatives read a modified version of the U.S. Constitution, a first. January 8, 2011: 2011 Tucson shooting: Representative Gabrielle Giffords and nineteen other people were shot by a gunman in Tucson, Arizona. Six of them, including a federal judge and a congressional aide, died. Votes on the House floor were suspended for one week. March 19, 2011: The United States initiated Operation Odyssey Dawn as part of the international military intervention in the Libyan Civil War. The intervention continued under the auspices of NATO as Operation Unified Protector until the end of military operations in October 2011. May 2, 2011: Navy Seals killed al-Qaeda leader Osama Bin Laden in Operation Neptune Spear. April 9, 2011: A last-minute deal between both parties averts a partial shutdown of the federal government. August 2, 2011: The 2011 debt-ceiling crisis ends with the Budget Control Act of 2011. December 18, 2011: The United States completed its withdrawal of troops from Iraq, formally ending the Iraq War. June 28, 2012: In National Federation of Independent Business v. Sebelius, the Supreme Court upheld the Affordable Care Act's constitutionality but found the expansion of Medicaid unconstitutionally coercive on the states. December 14, 2012: The Sandy Hook Elementary School shooting leaves 28 dead, and prompts debate on gun control in the United States. A failure to pass a 2011 federal budget nearly led to a shutdown of non-essential government services on April 9, 2011, with the furlough of 800,000 government employees appearing imminent. President Obama met Senate Majority Leader Harry Reid and House Speaker John Boehner in the days preceding the deadline but was unable to come to an agreement to pass a budget. A one-week budget was proposed to avoid a government shutdown and allow more time for negotiations; however, proposals from both parties could not be accommodated. Obama said he would veto a proposed Republican budget over Republican social spending cuts. This was also backed by Senate Democrats who objected to such cuts as that of Planned Parenthood. However, an agreement was reached between the two parties for a one-week budget to allow for more time to negotiate after Republicans dropped their stance on the Planned Parenthood issue. The two parties ultimately agreed on a 2011 federal budget the following week. There were many reactions to the possible shutdown with some saying the economy could be hurt during a fragile recovery and others saying the lack of an unnecessary bureaucracy would not be noticed. There was also criticism that while senators and representatives would continue to get paid others such as the police and military personnel would either not be paid for their work or have their payments deferred. On August 2, 2011, the United States public debt was projected to reach its statutory maximum. Without an increase in that limit the U.S. Treasury would be unable to borrow money to pay its bills. Although previous statutory increases have been routine, conservative members of the House refused to allow an increase without drastically reducing government spending. Over several weeks and months, negotiators from both parties, both houses, and the White House worked to forge a compromise. The compromise bill, the Budget Control Act of 2011, was enacted on August 2. For the first time in the history of Congress, over half its members were millionaires as of 2012; Democrats had a median net worth of $1.04 million, while the Republicans median was "almost exactly" $1.00 million. In this Congress, Class 1 meant their term ended with this Congress, requiring reelection in 2012; Class 2 meant their term began in the last Congress, requiring reelection in 2014; and Class 3 meant their term began in this Congress, requiring reelection in 2016. 2. Jesse Jackson Jr. (D), until November 21, 2012. Members' party membership by district. 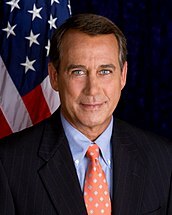 (R) Resigned May 3, 2011 due to an Ethics Committee investigation. (R) Resigned February 9, 2011, due to a personal scandal. (D) Resigned February 28, 2011 to become the head of the Woodrow Wilson Center. (R) Resigned May 9, 2011, when appointed to the Senate. (D) Resigned June 21, 2011, due to a personal scandal. (D) Resigned August 3, 2011, due to a personal scandal. (D) Resigned January 25, 2012, to focus on recovery from 2011 Tucson Shooting. (D) Died March 6, 2012. A special election was held November 6, 2012. Donald Payne Jr.
(D) Resigned March 20, 2012 to focus on gubernatorial campaign. (R) Resigned July 6, 2012 due to personal reasons. (R) Resigned July 31, 2012 due to personal reasons. Illinois 2nd Jesse Jackson Jr.
(D) Resigned November 21, 2012, due to a personal scandal. (D) Resigned December 3, 2012 to become Mayor of San Diego. (R) Resigned January 2, 2013 when appointed to the US Senate. ^ a b Senate Calendar for January 20, 2012. ^ Zeleny, Jeff (November 2, 2010). "G.O.P. Captures House, but Not Senate". New York Times. Retrieved November 3, 2010. ^ Abramowitz, Alan (December 12, 2010). "Get ready for the most conservative Congress ever". Salon.com. Retrieved July 13, 2012. ^ Yadron, Danny (January 6, 2011). "House Reads Constitution, Gets Civics Lesson". Wall Street Journal. Retrieved January 12, 2011. ^ "Odyssey Dawn: Phase One Of Libya Military Intervention". The Epoch Times. March 19, 2011. Archived from the original on February 23, 2015. ^ "US troops complete their withdrawal from Iraq". Herald Sun. Australia. Retrieved December 18, 2011. ^ Rowley, James (April 7, 2011). "U.S. Government Shutdown Threatens 800,000 People As Obama Seeks Solution". Bloomberg. Retrieved May 10, 2011. ^ "US budget talks remain deadlocked". Al Jazeera. April 8, 2011. Retrieved May 10, 2011. ^ a b Davis, Julie Hirschfeld; Faler, Brian (April 9, 2011). "Wrangle Over U.S. Budget Compromise Defines Next Two Years' Fiscal Debate". Bloomberg. Retrieved May 10, 2011. ^ "Pres. Obama and Congressional Leaders Reach Budget Deal". CSPAN. April 8, 2011. Retrieved May 10, 2011. ^ Dodge, Catherine; Goldman, Julianna (April 8, 2011). "Long Government Shutdown Would Harm U.S. Economy, Hit Washington Hardest". Bloomberg. Retrieved May 10, 2011. ^ "Editorial: Government shutdown survival guide". The Washington Times. April 7, 2011. Retrieved May 10, 2011. ^ "U.S. Senate, Democratic Committees". Archived from the original on May 4, 2011. Retrieved May 5, 2011. ^ "U.S. Senate Conference Secretaries". Retrieved May 5, 2011. ^ a b c "U.S. Senate, Democratic Steering and Outreach Committee". Archived from the original on August 6, 2011. Retrieved August 10, 2011. ^ Office of the Speaker of the House (December 2, 2010). "Pelosi Announces Steering and Policy Committee Members". PR Newswire. Retrieved February 17, 2011. ^ "Congressman Capuano's Update". FN Online. February 3, 2011. Archived from the original on July 26, 2011. Retrieved February 16, 2011. ^ "Millionaires' Club: For First Time, Most Lawmakers are Worth $1 Million-Plus". OpenSecrets Blog. The Center for Responsive Politics. January 9, 2014. Retrieved January 12, 2014. ^ "Half of US Congressional politicians are millionaires". BBC News. January 10, 2014. Retrieved January 12, 2014. ^ a b c d e f "House Floor Activities: Legislative Day of November 13, 2012". Washington, D.C.: Office of the Clerk of the U.S. House of Representatives. Retrieved February 3, 2019. ^ Access Denied. NationalJournal.com. Retrieved on August 16, 2013. ^ "Nevada Sen. John Ensign announces resignation". Politico. April 21, 2011. ^ a b Murray, Mark (April 27, 2011). "Sandoval appoints Heller to fill Ensign seat". NBC News. ^ Heller in transition: One foot in House, one foot in Senate | Las Vegas Review-Journal. Lvrj.com (May 3, 2011). Retrieved on August 16, 2013. ^ "Sen. Daniel Inouye dies of respiratory complications". MSN News. Associated Press. December 17, 2012. ^ "South Carolina Republican US Sen. Jim DeMint resigning to take over at Heritage Foundation". The Washington Post. December 6, 2012. Retrieved December 6, 2012. ^ Scott's appointment took effect January 2, 2013, upon his resignation from the House of Representatives; he took the oath of office on January 3, 2013. ^ "Lee Resigns After Photos Surface". Political Wire. February 9, 2011. Archived from the original on February 12, 2011. Retrieved February 9, 2011. ^ "Governor Cuomo Signs Bill to Ensure Military Voters are Treated Fairly in Special Elections, Calls Special Election in 26th Congressional District". Governor of New York's Press Office. March 9, 2011. Retrieved March 9, 2011. ^ Allen, Mike; Cohen, Richard E. (February 7, 2011). "Rep. Jane Harman to resign from House". Politico.com. Retrieved February 17, 2011. ^ "Governor Brown Issues Proclamation Declaring Special Election for 36th Congressional District". Governor of California Press Release. March 14, 2011. Archived from the original on June 2, 2011. Retrieved March 14, 2011. ^ "Sandoval Sets Fall Special to Fill Heller's Seat". Roll Call. April 29, 2011. Retrieved April 29, 2011. ^ Camia, Catalina (June 20, 2011). "Anthony Weiner Officially Steps Down Tuesday". USA Today. Retrieved June 21, 2011. ^ "Giffords resigns House seat to focus on recovery". Associated Press. January 25, 2012. ^ Nowicki, Dan (January 27, 2012). "Brewer sets Giffords seat election dates". AZCentral.com. The Arizona Republic. Retrieved January 27, 2012. ^ "U.S. Representative Donald Payne dead at 77". New Jersey Real. March 6, 2012. ^ Livingston, Abby (March 30, 2012). "New Jersey: Special Election Dates For Payne Seat Set". Roll Call. Retrieved March 31, 2012. ^ "Inslee resigning House seat for governor's race". Politico.com. March 10, 2012. ^ Cornfield, Jerry (March 29, 2012). "Gregoire: Election in works to replace Inslee". HeraldNet. The Daily Herald. Retrieved March 31, 2012. ^ "Rep. Thaddeus McCotter resigns from Congress". Abcnews.com. July 6, 2012. ^ Toeplitz, Shira (July 10, 2012). "Michigan: Governor Calls Special Election for Thaddeus McCotter Seat". Retrieved July 11, 2012. ^ "Statement from congressman geoff davis". July 31, 2012. Archived from the original on August 2, 2012. Retrieved July 31, 2012. ^ Associated Press (August 17, 2012). "Beshear calls special election to replace Davis". ^ Doyle, Michael (August 14, 2012). "Capitol Alert: Rep. Dennis Cardoza announces resignation". Archived from the original on August 15, 2012. Retrieved August 14, 2012. ^ "VIDEO: Speaker Boehner Swears In Father Patrick J. Conroy as House Chaplain". May 25, 2011. Archived from the original on September 30, 2011. Retrieved January 25, 2012. ^ Matthew A. Wasniewski (Matt) - Congressional Staffer Salary Data. Legistorm.com. Retrieved on August 16, 2013. "Videos of House of Representatives Sessions for the 112th Congress from www.C-SPAN.org". "Videos of Senate Sessions for the 112th Congress from www.C-SPAN.org". "Videos of Committees from the House and Senate for the 112th Congress from www.C-SPAN.org". House of Representatives Session Calendar for the 112th Congress, 2011 calendar (PDF). House of Representatives Session Calendar for the 112th Congress, 2012 calendar (PDF). Senate Session Calendar for the 112th Congress (PDF). Congressional Pictorial Directory for the 112th Congress (PDF). Congressional Pictorial Directory for the 112th Congress (1st Revised Edition) (PDF). Congressional Pictorial Directory for the 112th Congress (2nd Revised Edition) (PDF).